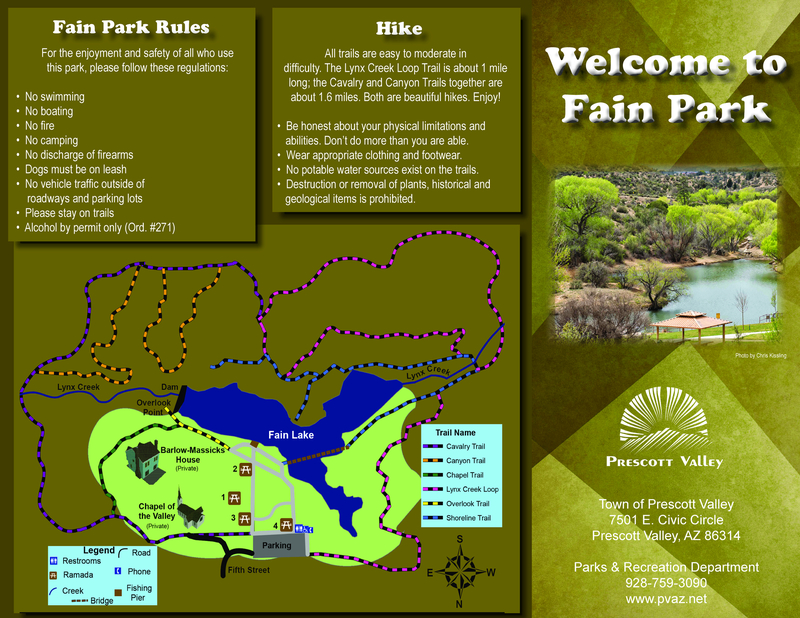 Overview: Prescott Valley's Fain Park is located along Lynx Creek just south of Highway 69, and features several signed interconnecting trails that loop around the park. Mileage will vary depending on the trail you choose. Fain Park offers picnic ramadas, limited gold panning, a refurbished stamp mill, the Barlow-Massick "Castle on the Creek", and the Fitzmaurice historic ruins. The town has not yet developed the historic townsite of Massicks. Neither the Castle nor the Fitzmaurice ruins are open to the public. Fain Lake is stocked by Arizona Game and Fish with rainbow trout. Swimming, campfires, and overnight camping are not allowed. From Prescott, travel east on Highway 69 to Prescott Valley. Turn right (south) at the Prescott East Highway stoplight, and follow the signs to Fain Park (less than a mile south of Highway 69 along Lynx Creek).